By CE Pro Editors · February 20, 2019 • The Seymour-Screen Excellence TRIM line of masking screens are available in a choice of sizes, and are supported with a choice of screen materials. 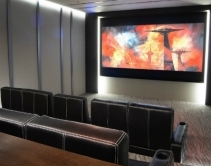 By Lisa Montgomery · September 13, 2018 • Da-Lite showcases its problem-solving home theater screen at the Legrand booth; works for just about any viewing environment. By Robert Archer · August 14, 2018 • Da-Lite Parallax 2.3 screens are designed to work in a variety of environments and feature a viewing cone of 46 degrees. 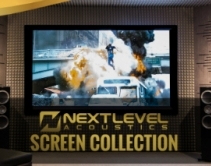 By Robert Archer · March 22, 2018 • The newly announced Next Level Acoustics Projection Screens include a choice of matte white, acoustically transparent and ambient light rejecting options to provide integrators a range of video products that support 1.78:1 and 2.35:1 aspect ratios.